I wonder what Splendid would look like if he were in a complete stereotypical super suit, well maybe this. 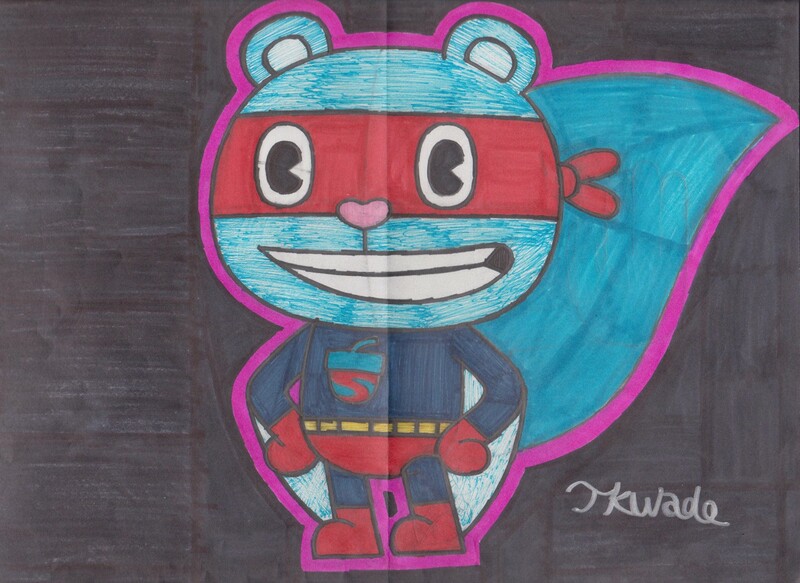 When Splendid is dressed up like this, the outfit comes with not only his red mask, but also a complete and fully equipped superhero costume, including a Superman-esque logo shaped like an acorn. How do you like him in this outfit now? You see that line in the middle of the paper, I've folded in half, which what I'm not supposed to do. In fact, this was going to be a Splendid vs Splendont drawing, but it turns out to be Splendid in a complete superhero outfit. Since Splendid is seen wearing a complete super suit, does he need a cape as well? No, because he has gliding wings that are equipped to be able to fly. Now that's Splendid in a complete costume, end of story.